The rocks you choose will help set the tone for the rest of your garden. Tawny beach pebbles or river rocks add warmth, while white marble chips help brighten up shady areas. Flat terracotta stones complement a tropical landscape, but can seem out of place in a more formal garden. For a minimalist modern landscape or Polynesian-themed garden, try black lava rocks. Check out photos of rockscapes online to see what appeals to you. Because stones last indefinitely, it's important to choose a look you'll be happy with for many years. Rocks may be more expensive than mulch, but they have several advantages as a groundcover. The first is durability. Mulch must be replaced every season, while rocks can last the lifetime of your garden. Another advantage is that pale-colored stones provide striking contrast against deep-colored foliage and help brighten up shady corners of your landscape. "Call attention to a favorite shrub or specimen tree by surrounding it with medium-sized river stones. This creates the effect of a 'living sculpture', " says landscape architect Maureen Smith. Rocks will also discourage weed growth around your prized plant, but for the best results, install a weed barrier before putting the stones in place. For a more exotic look, add a rock garden to your landscape. Choose an area that gets plenty of sun and install two or three small boulders. Surround the boulders with closely spaced low-lying flowers, such as portulaca (left), ground orchids or decorative cactus. 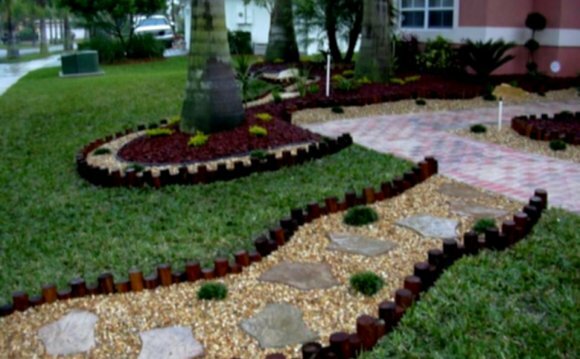 Carefully fill in the gaps with smaller stones that complement the color of your boulders. A large, unusually-shaped boulder can serve as an eye-catching focal point. Use as a tidy, low-maintenance centerpiece in a small garden, where an ornamental shrub might become too large or unruly. In larger gardens, a rock centerpiece can add visual interest to monotonous border areas, such as hedges. Large rocks are the key to giving your backyard pond that fairytale look. The right type of stone will help camouflage unsightly black pond liners and provide contrast to the dark pond water. Avoid using even rectangular pavers. For the most natural effect, choose rocks that are similar in size but irregular in shape and color. Instead of setting up a container garden on your deck or patio, where the pots need regular watering, place them in a rockscape that's within reach of your sprinkler system. Line the area with a weed barrier and set the containers on top. Cut holes in the barrier, so the bottoms of the pots can fit through and settle into the soil. Make sure the pots have adequate holes for drainage. Surround the pots with small stones in a complementary color. The result is a striking container garden that gets watered whenever your sprinklers come on. A stepping stone path is a picturesque option for those shady areas alongside your house, where there is too little sun for most plants to thrive. It's also a practical way to keep shoes clean when walking up to a side door or back door. For a tidy look, surround large stepping stones with small pebbles in a contrasting color. Your home is your castle. But you will not feel truly protected in this "castle" if there are problems with the roof. Meet Commercial Roof Repair of America Roofing, they will come to the rescue! This company has many years of experience in the field of commercial roof repairs. Whatever the problem with the roof of your house is, America Roofing is ready to fix it. Do not doubt, the best materials and the most advanced technologies will be used. Contact America Roofing by phone or online for details.